Finally off Utila and I could not be happier. Once I got to La Ceiba I caught up with Noemi who had left a day earlier. We had a great girls night in a hotel with pizza, beer and ice cream. She left early the next morning so I got in contact with Angel and he kidnapped me back to the jungle. Though I didn’t put up much of a fight! Angel took me on all the tours at Jungle River Lodge. 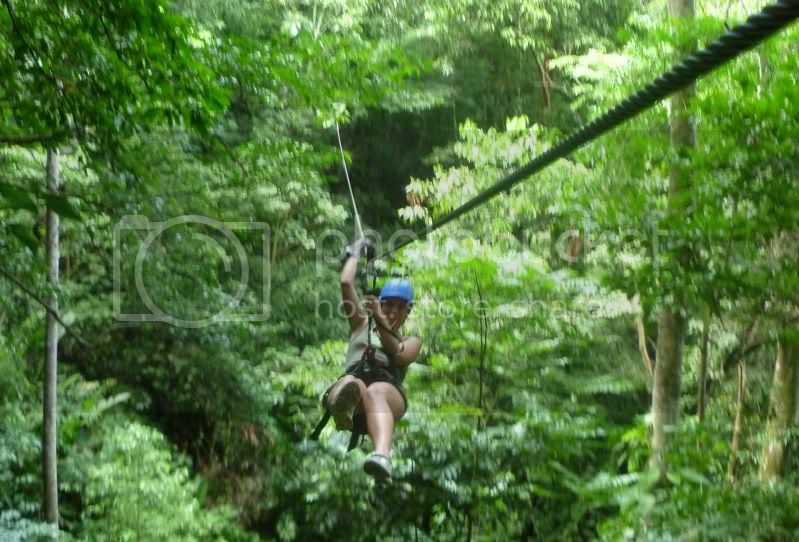 The first day we went canopying and had a hoot!! The next day was also incredible. We started by going white water rafting. Angel knew I have been rafting a few times and seeing how I wasn’t a paying customer I got to be the guinea pig for the raft guide he was training. When we came to a point in the river, Angel looked at me and said “if anything happens, swim to the left”. I yelled at him for saying that for now we were jinxed. Sure enough, next thing I know I was scrambling for air after the raft flipped. Not only did we flip but when I fell in, my bikini bottoms came undone! So now I am trying to keep my head above water, my bikini bottoms on and avoid any rocks. I have fallen out of a raft before but nothing like this. I was pretty scared. After we got to safety and finished our trip, Angel took me on hike to a waterfall. But he didn’t take me on the route the tourists take, oh no. He had me jumping off cliffs into the river, swimming through rapids, wading through water up to my waist, climbing slippery rocks and dodging army ants. It was definitely a real adventure. He was walking along catching toads and other various creatures. 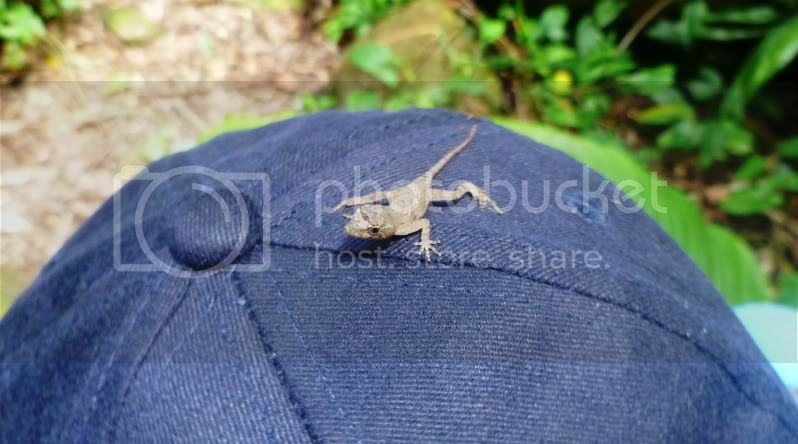 I was jealous so I caught him a lizard which he put on his hat and kept for the rest of the walk. That night Angel and I were bored so we decided we’d split up and see who could catch the most geckos. I unfortunately lost, but I also didn’t grow up in the jungle catching them daily. He put one up to my cheek to make it “kiss” and the little bugger bit me! Then he made another bite my leg as well! I was not impressed! On the third day we went canopying again and Angel insisted that I eat termites. He stuck his hand into the termites nest and grabbed a few. He held two in between his forefingers and put them into my mouth; they didn’t really move and freak me out as much as I thought they would. I just chewed them up as fast as I could and to my surprise they taste like carrots! After canopying I helped the boys out cleaning helmets, we took all of them apart and put them into bleach. We scrubbed them right down until they looked new again. I woke up the following day and when I came downstairs I was shocked to see a familiar face!! Imran, a friend from Utila, had come to the jungle with some friends to do some rafting. After they finished that afternoon, we all hiked back to the waterfall. His friend, Rich was like a little kid once he got there. His smile was ear to ear and he was in awe of this feat of Mother Nature. We all jumped in and took a million pictures of ourselves playing in the falls. Imran and Rich the next day decided I was going with them to Copan. I knew it was going to be hard leaving the jungle. The guys that work there had made me feel like family. As I was saying my goodbyes I was trying my hardest to keep it together. Though once I got to the jeep to take us back to the city I burst into tears. It was the hardest goodbye I’ve had to deal with since I’ve started this trip. The jungle was the first place that made me feel at home, and I had to leave that behind. I was lucky to have Rich and Imran with me to keep me together. I don’t think I could have done it alone. This part of my journey has been purely about slowing down in this speed obsessed world. No pressure mon! Once all my papers were in order and bank accounts restored I headed down to Tulum, Mexico via Valladolid. From there me and a few travel companions headed south to Belize with the goal of going straight to Caye Caulker. Instead the bus arrived late to pick us up, and had many long stops along the way and arrived half an hour later then the last water taxi to the islands. With our late arrival in Belize City and having heard nothing but horror stories about the city we quickly got ourselves to a hostel. Now given the state of Belize City tourism and the general apprehension even the most experienced travelers had about even going in the first place to Belize City you would think that the prices for the hostel would be less then American prices, but such was not the case and we shelled out more then our fair share for the beds. The city itself was pretty nice, though the poverty was quite apparent. We went out for a traditional Belizian dinner and enjoyed a bit of their nightlife. Country karaoke anyone? First thing in the morning we had breakfast and took an early water taxi to Caye Caulker. The moment I saw it, I loved it. The first thing I noticed was that there were no paved roads, only white sand roads. The only cars were those of the police and if you really felt the need to motor around you could take golf cart style taxis to get from one side of the island to the other. Prices were back to normal and the people were friendly. As soon as I checked into the hostel I found my way to Raggamuffin Tours where I got the last spot on a snorkeling sailboat out to the barrier reef. I wish I had an underwater camera with me. I saw fish of all sorts of amazing variety, pet a nurse shark and a sting ray, free dove to see in underwater caves, and witnessed endangered turtles in a marine reserve swimming around. Breathtaking and beautiful. Slightly tipsy from the rum-punch they served on our way back I went out for dinner. Later me and a few friends went to a bar/restaurant called Herbal Tribe where we had a few drinks and talked with some amazing local characters. I had a long philosophical discussion with a gentleman called ManDingo, a self proclaimed prophet and generally interesting person. I look forward to seeing him again. I spent the next day just lounging and exploring the island and left the next day for Flores, Guatemala. Flores is a small town on an island in a lake surrounded by Santa Elena a town of slightly larger population. It is about an hour from the famous Mayan ruins of Tikal. I explored the island, had some down time and visited the ruins. What set these ruins apart was the jungle backdrop. With howler and spider monkeys around as well as birds of all types, crocodiles and other fun wildlife chasing after me. Also just the sheer area that the multiple ruins covered. It was certainly an impressive site. So now I am in Quetzaltenango(aka Xela), Guatemala for the next month to focus on language learning and business. So probably less excitement and relaxing and more self development stuff for the next little while.